“The Three Intentional Corrections” is the name of a simple and valuable health practice that you can apply throughout the day. It is a method of shifting yourself into a higher and more healthful state of being. It is a quick, mini-practice that you can use for getting back on track at any time. All you do is ask yourself three questions, then respond with the appropriate shift. For the posture question, you may find yourself slumping at the keyboard, leaning on one leg too much, locking your knees, tightening your head, etc. When you notice a posture problem just: Unslump, balance the lean, release the knee lock, or relax the head. With better posture you will gain energy, avoid structural problems, and be more present. Checking in and shifting again and again throughout each day will have long-term benefits in how you feel, how you operate in the world, and in maintaining health. After the breathing query you may find yourself with such problems as restraining your breath, breathing high in the chest instead of in the lower torso, straining the shoulders or neck, or breathing too swiftly. Inhale a deep, full, easy breath as best as you are able. Cultivating a habit of empowered breathing will help with energy levels, immune function, thinking clarity, mental calm, relaxation and much more. Good breathers live longer too. A look at consciousness means: Where is your mind? Are you, as most of us are in America, overly-entrenched in your brain? You might notice sometimes that when you try to think something through you put a lot of energy into the head. This actually takes you away from the truth of the present into our memories, beliefs, fears, and rationalizations. You want to have your consciousness in your entire body, equally strong in all parts. Withdrawing awareness from parts of yourself leads to physical problems and lessens your unique intelligence. I’ve noticed this problematic pattern many times with clients in my healing practice. Make the shift, relax the energy down (if it is indeed packed in the head), and think from your body, with the brain as part of the body, not the master with all the power. One of the reasons for applying the Three Intentional Corrections regularly is that our habits of being usually take magnitudes of repetition to break and change. If not changed, then our bodies, breathing, and mind sink into ruts that are difficult to lift out of. They cement into patterns that feel natural but are not. Repeatedly enacting intentional shifts begins to retrain you toward a more holistic, balanced, and effective ways of being. Eventually you may find yourself practicing the Three Intentional Corrections in a smooth, single flow to bring yourself back to balance. You will shift your posture as you inhale in a breath, then exhale your consciousness into your whole body. I taught Karen the Wall Sits exercise (see the post Heal Knee Pain.) Karen had been dealing with knee pain, and had some hip pain as well. I thought the wall sit would be a useful prescriptive exercise for her. By building the strength of her thighs while aligning her joints, the knee would be given a break from over-working. Knees need a vacation too, sometimes. Karen practiced her Wall Sitting daily. When she came back for a session after three weeks, her knee pain was nearly gone. The pain had been with her for months before that, and often caused sudden, grimace-inducing shocks. Karen had been doing her Wall Sitting every morning. Her deal with herself was to do the Yoga Sun Salutation, and then the Wall Sitting, before she left her bedroom. Then she could go out to the kitchen and make coffee. A good idea, to reward herself this way. She wisely used this method to get her work in, everyday. In our follow-up session together, I had her show me her wall squat technique. It is always beneficial to get refinement pointers. In the previous session, her form looked cramped and uncomfortable. Now, after three weeks of practice, she looked comfortable in the pose. She was much more aligned along the four vertical pairs of joints (ankles, knees, hips, shoulders) and more stable. I made some suggestions for refinement, but mostly I wanted to encourage her to continue. Some days Wall Sit for longer, up to a minute per rep, and go deeper. Other days, stay for just 30 seconds and don’t bend as deeply. Make sure the lower legs are lined up with the upper legs, directly below them. If the ankles splay out from the knees laterally it could, eventually, cause pain on the inside or outside of the knees. While it is important to relax the muscles and let the weight descend to the thighs; it is also important to keep the joints open. In Qigong terms, this is simultaneously letting the body sink to the earth and ascend to heaven. The muscles relax down into gravity while the joints expand and levitate upward. Wall sitting is one of those great exercises that brings multiples benefits. Wall sitting is primary prescribed as a homework exercise for people who need to strengthen their legs, yet cannot exercise much because of knee pain. This might be a chronic issue, like an arthritis, or it can be from an injury. Wall sitting can help strengthen, heal and align the ankles and hip joints as well. Lean your back against a smooth wall. Position your feet about hip-width. Inch your feet forward 12 or 15 inches. This distance will depend upon how long your legs are and how low you can comfortably sit. The longer the legs, the longer the distance you slide your feet forward. The more knee discomfort, the less distance. You might place a pillow or rubber ball between your knees. This is to stabilize the knees. You do not want your knees to bend inward. Slide your back down the wall. Fitness authorities usually recommend that you slide so far down that your knees are bent 90 degrees. In other words, the tops of your thighs are horizontal and you are in a full sitting posture, as if you were on an invisible chair. Actually this amount of squat is too much knee bending for many people. The goal is to safely strengthen the legs, not to achieve an athlete’s level of performance. How Do You Determine How Far Down to Squat? Come to a position that is comfortable, and does not cause extra pain in your knees. Pain will create tension in your body, and undo the gain of the exercise. Just be able to feel the pump in the quadriceps, then you can build muscle and strength. The secrets to the results of wall sitting are that it does not reinjure your knees through repetitive strain; and the longer you sit, the more your leg muscles respond and grow. If you can’t bend very far, you may want to try and hold the pose for a longer period to get the quadriceps pump. One person I taught this to called it the ski burn. I recommend 30 seconds to 2 minutes. Over several weeks or months of building up with this exercise, your legs will get noticeably stronger and knee pain should decrease. You will deepen how low you go in your squat as your legs get stronger. But always avoid knee pain. Never go too deep. After sitting for 30 seconds to 2 minutes, get up and walk around for a minute or two, then perform another rep of the same length of time. Again rest and walk around; then do the third and final Wall sitting rep.
As you let your legs take all of the weight of the body from the pelvis up, the shoulders no longer act as if they have to hold you up. The muscles of the neck and shoulders begin to let go and sink down. Knees in front of toes. Could lead to pain in the kneecap. Don’t bend the knees so far forward that, if you look down, you can’t see your toes. The lower legs should be vertical, not angled forward. Feet too wide or not wide enough. Keep the four pairs of joints lined up. Knees bending inward or outward. Knees bending inward can injure the medial knee, while knees bending outward, cowboy style, can injure the lateral knee. When I was first learning Qigong standing practices I was taught what I now consider to be a too-wide knee posture. My knees ached, on and off, for years until I corrected my training. Feet not pointing straight ahead. Make sure your toes are not angled outward or turned inward. Keep the toes exactly forward. This will help with a natural, normalizing process of balancing your major pairs of joints. The ankles should be perfectly aligned under the knees, which are aligned under the hip joints. Putting weight onto the front of the legs. Try to sink your weight into the big muscles of your thighs. Bending forward at the waist. People sometimes do this to take some of the stress off the leg muscles–the beneficial burn. This will put the stress of your weight on lower back and not help your leg strength, knee health, or alignement. 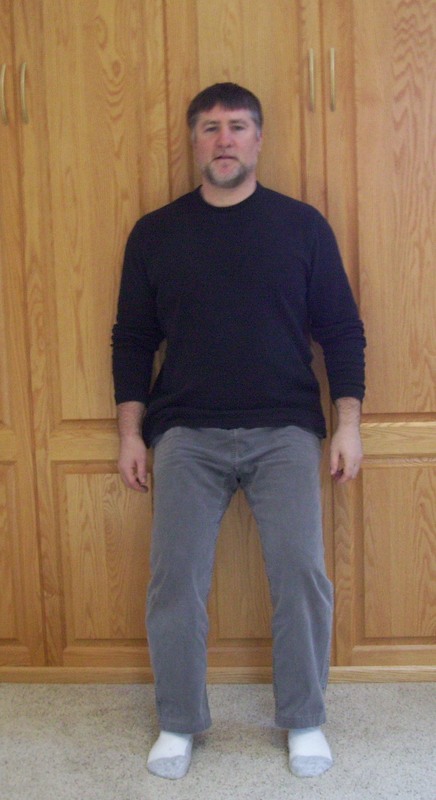 Lean back into the wall to maintain a vertical posture. Wall sitting strengthens the legs, helps rickety-stickety knees heal, aligns your skeleton, and improves your posture. But there is yet more to wall sitting. Wall sitting is an internal self-regulation exercise also, a Qigong (chi kung.) Wall sitting can increase vitality. This is done through regulating the breath, opening all of the joints, aligning the bones, feeling the vitality of the body, and calming the heart and mind. Relax as much as possible, have an upright posture and keep all the joints open. You also want to pay attention to the flow of energy through the body as you sit. Feel and visualize your joints opening up and out. Imagine subtle rivers of energy running up and down your body, connecting your bones. Breathe deeply but as easily as you can. Keep the breath low in the body if you are able.